Built in and around an old sand quarry, Scotland Run offers a distinctive blend of quarry and links-style holes. The most unique characteristics include expansive waste areas and an imposing display of cliffs. 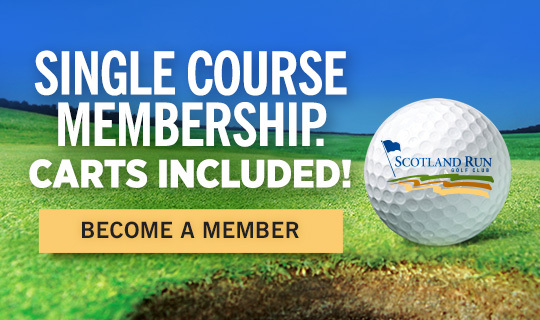 Located 20 minutes from downtown Philadelphia and 45 minutes from Atlantic City, Scotland Run is open to the public year-round for daily fee play, group outings & banquets. Enjoy special golf rates at all of our properties on Easter Sunday, April 21. An elegant, glass enclosed cocktail reception room with sweeping views of the golf course and spacious outdoor patio. Book your wedding or banquet today and be among the first to experience the unparalleled luxury. Visit soon for great service, a delicious menu and an unbeatable atmosphere. Sunday Brunch is served every Sunday from 10am to 2pm. Designed by nationally renowned architects Ault, Clark & Associates the course uniquely blends traditional architecture with subtle modern-day nuances.